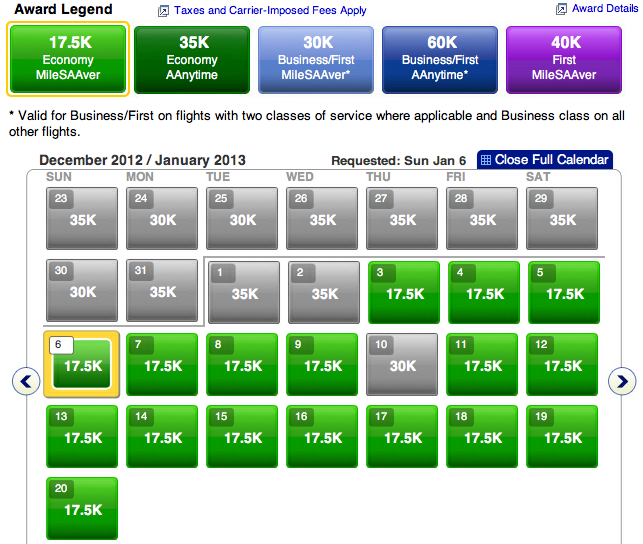 Today I will talk about how to redeem American Airlines AAdvantage miles for free award flights. Me and the fiancee spent the required $3000 per card and the bonus AAdvantage miles (50,000 x 2 = 100,000 AA miles) posted to her account quickly. We’ve picked a honeymoon destination in the Bahamas and a travel date on Jan 6, 2013. 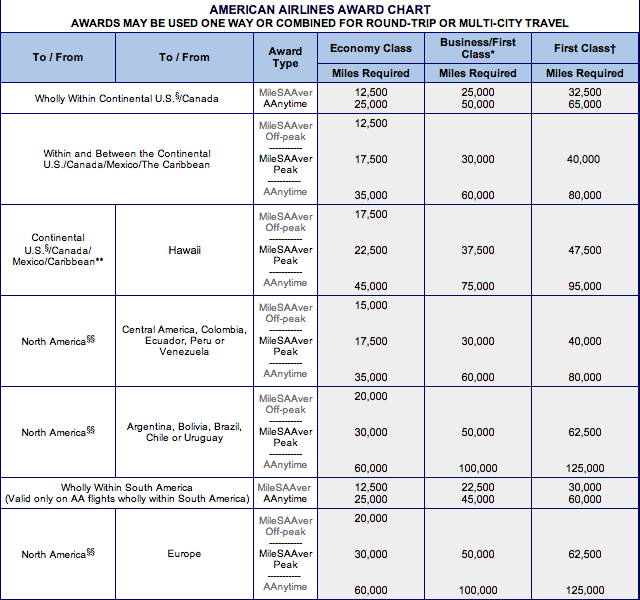 As you can see from the chart, the cheapest flights would cost 17.5K miles to redeem, and first class flights could be redeemed starting at 30K miles. When booking travel awards, always try to book your flight as soon as you are positive about the travel dates. Ticket prices vary and when it comes to last minute air travel, it’s definitely NOT cheaper to redeem miles for free flights last minute. Also, the earlier you book a flight, the earlier you can choose desirable cabin seats towards the aisle or front of the plane. The total cost of booking our honeymoon flight: 35,000 miles and $10. We chose not to fly first class in order to save extra miles for other future travel. The best part of spending $10 on AA.com is that after this purchase, our credit card will give us a $150 statement credit after first purchase through American Airlines (part of the credit card offer). To get an idea of how hot of a deal this is, I went ahead and priced the exact same trip with normal travel rates, and take a look at the price: $669.40. Trust me, this is the absolute cheapest fare for 2 one-way Economy Super Saver tickets to the Bahamas. We’re not sure how long we intend to stay in the Bahamas, so we did not book a return flight yet. It is important to make sure that you can commit to the flight before booking. American Airlines does allow for award flight cancellation and mileage reinstatement if you cancel a flight. However, they do charge a $150 processing charge per account for the first award. Any additional awards reinstated to the same account at the same time will have a $25 charge per award. Award flight reservations can be cancelled by calling 1-800-882-8880. As soon as we decide when we’re coming home, we’ll go ahead and book a free return flight. After all, we still have 81,491 AAdvantage miles left…and that balance keeps on growing.